Lego Education has compiled a set of its DUPLO bricks and other components into a kit branded as "STEAM Park," intended to help preschoolers try out activities in science, technology, engineering, arts and math. Teams of students work to build an amusement park with rides, stands, animals and other attractions. In the course of building the park, the kids are introduced to the workings of gears and ramps, movement in water, chain reactions, probability, performance, problem-solving and collaboration, among other lessons. The kit is about $150. A 48-page freely available teacher guide includes eight lessons and tips for how to use the set in the classroom. 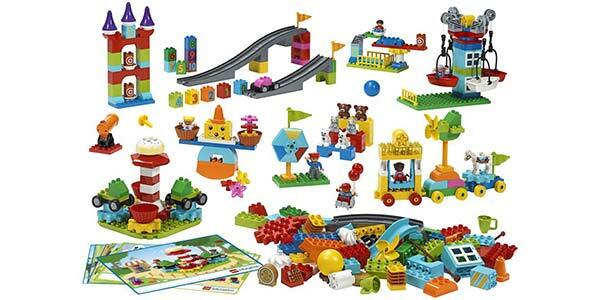 The kit includes 295 DUPLO bricks, which are larger than standard Lego bricks. The set has gears, tracks, pulleys, boats and figures, as well as eight double-sided building inspiration cards with 16 models to build. "STEAM Park helps children learn the formative 21st century skills including problem solving, collaboration, creativity and critical thinking, which are needed to help them succeed in all subject areas throughout their education," said Esben Stærk Jørgensen, president of Lego Education, in a press release.